A novel copolymer poly(thiophene-2,5-diyl-2,5-di-n-octyloxycarbonyl-1,4-phenylene), denoted as P33, is introduced as potential material for photovoltaics, polymer light-emitting diodes, and/or organic transistors. P33 dissolved in chloroform is investigated by steady-state absorption, linear/non-linear fluorescence spectroscopies and time-resolved fluorescence spectroscopy. Molar extinction coefficient, fluorescence quantum yield, and singlet fluorescence lifetime of P33 are determined to be 18,315 M−1 cm−1, 0.4, and 810 ps, respectively. The P33 fluorescence fast components of decay times are 1.2 ps, 2.0 ps, and 0.5 ps for increasing wavelengths of 480 nm, 500 nm, and 520 nm, respectively. The fast component is attributed to a transport of nearly instantaneously formed excitons to localized states known as downhill energy transfer. Additionally multi-photon excited fluorescence is observed for pumping with wavelengths of 800 nm and 1200 nm. Two-photon absorption cross-section is determined to be 6.9 GM. 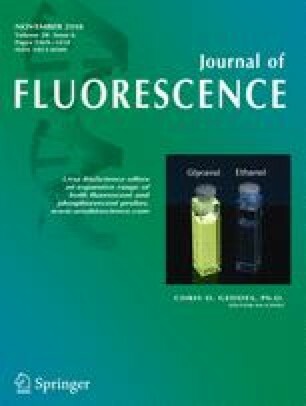 These spectroscopic studies provide basic fluorescence characteristics of the novel thiophene copolymer P33. The online version of this article ( https://doi.org/10.1007/s10895-018-2295-3) contains supplementary material, which is available to authorized users. This work was supported by VEGA 1/0400/16.